2015 marked the beginning of a new age in the treatment of ischemic stroke: Multiple randomized prospective international multicenter studies (MR CLEAN, SWIFT-PRIME, ESCAPE, EXTENDA-IA, REVASCAT) have shown the high level of effectiveness of endovascular therapy, i. e., minimally invasive removal of a thrombus with the help of a catheter system (stent retriever) under angiographic guidance        . The level of evidence for mechanical thrombectomy with stent retrievers is now 1a and for thrombus aspiration is 2a. The endovascular treatment option thus became the leading evidence-based treatment for severe ischemic stroke (NIHSS ≥ 6 for stroke in the anterior circulation) and is accordingly recommended in national and international guidelines  . The current estimate in Germany is 260 000 strokes per year. 80 % to 85 % of these patients suffered an ischemic cerebral infarction, approximately 25 % of which can be systemically treated with rtPA (“recombinant tissue plasminogen activator”). 5 % to a maximum of 10 % of all patients with ischemic stroke are suitable for endovascular treatment with mechanical thrombectomy and must reach an appropriate treatment center in time (“time is brain”). We assume that all suitable patients in Germany are able to be treated at certified centers equipped with this treatment option. The consequences of the new evidence are major and include the transition of an individual medical treatment to a recognized treatment method. The next step was to ensure professional training that is integrated in specialist training requirements and thus provides the basis for specialization as an interventional radiologist      . This structured training is ensured in Germany with specialist training in radiology and complementary specialization in neuroradiology. Certification represents a further step in the creation of a quality structure through data collection as performed on a voluntary basis for more than two decades by the DeGIR system developed by the Institute for Quality and Patient Safety (BQS). In the final step, a proven effective treatment must be provided on a comprehensive basis since every patient has a right to receive a recognized disease-specific treatment. This comprehensive care is based on the existing structures of stroke units (17), which are a requirement for interdisciplinary stroke-specific treatment by neurologists, radiologists and neuroradiologists. 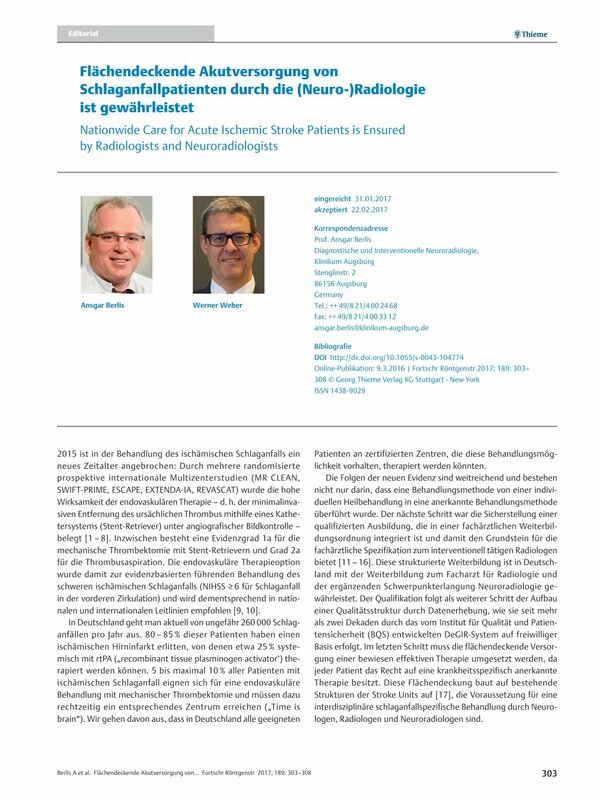 German neuroradiology, which played an important role in the introduction and clinical development of thrombectomy, was not surprised by the new situation in 2015. The German Society for Interventional Radiology and Minimally Invasive Therapy (DeGIR) and the German Society for Neuroradiology (DGNR) have been offering certificates for neurointerventional procedures (modules E and F) since 2012. “Module E”, part of the ongoing series of treatment fields in interventional radiology, includes all vessel-opening procedures involving the vessels supplying the brain (extra- and intracranial). Mechanical thrombectomy in acute stroke is one of these procedures. 100 interventions, at least 30 extracranial and 30 intracranial, must be documented for certification in this module. Only specialists in radiology are eligible for certification. Proof of the number of cases can be provided via the DeGIR register for quality management [www.degir.de]. A survey was performed in late summer 2015 to determine the availability of care in Germany. The survey had an unusually high rate of participation. At that time there were 279 stroke units in Germany including 106 national stroke units/neurovascular networks (17). Neurointerventional care at the national stroke units is provided by neuroradiologists in approx. 85 % of cases and radiologists in approx. 15 %. At the end of 2015, 123 hospitals in Germany had teams available to perform mechanical thrombectomy 24 hours a day 7 days a week. Over 420 neurointerventionalists were available, 320 of whom had DeGIR/DGNR level-2 certification for module E or had submitted an application for processing. In the same year, 285 institutes/hospitals entered data in the BQS system. 169 entered data for module E. 7302 neurointerventional recanalization treatments were documented in detail. This number shows that thrombectomy, which, with more than 70 %, accounts for the greatest portion of module E data, is an integral part of the actual situation in medical care. Compared to the data entered in 2013 (4849 datasets) and 2014 (5411 datasets), the entered data also documents the increase in activity and the verifiable increase in acute stroke therapy. Under consideration of the voluntary nature of the data entry and the lack of participation of some hospitals, a significantly higher number of actual cases can be assumed. In our opinion, the presented map of Germany ([Fig. 1] and [Table 1]) impressively documents the status of German (neuro-) radiology in year 1 of the evidence regarding endovascular stroke treatment. 114 hospitals that consented to publication of their data (address with or without specification of the number of module E cases in the year 2015) are included. Of the total of 169 institutes/hospitals that entered data for module E, 132 responded to the survey. This yields a very good participation rate of 78 %. Of the 132 institutes/hospitals, 18 refused to be named on the map and 32 only wanted to be named as a center without numbers. The hope is that in the future the motivation to enter data will not only continue but also increase and that even more hospitals will participate. Fig. 1 114 of 129 hospitals gave their consent that the module E cases of the year 2015 was allowed to be published. The first section describes the hospitals listed alphabetically in ([Table 1]). The sedond section specifies the number of Module E cases (k.A. means unspecified). Legende Rückmeldung: Alles (= Nennung von Klinik und Fallzahl); ja-verblindet (= Nennung der Klinik ja-verblindet Fallzahlen); Nichts (= keine Zahlen, keine Nennung der Klinik). The map ([Fig. 1] and [Table 1]) also shows that there is a lack of individual established hospitals with a high level of expertise and a large number of cases. For the future, it would be desirable for this map, which is also to be published in upcoming years, to provide an even more realistic representation of the nationwide care available in Germany. In addition, the quality of data entry is to be improved. Starting in 2017, we expect better delineation of acute stroke treatment within module E and statements regarding the clinical success of this treatment as a result of some changes to the software. We should all be invested in documenting the good quality of the comprehensive treatment of acute stroke by qualified radiologists and neuroradiologists. The implementation of current recommendations and guidelines regarding stroke treatment and training      , the availability of specialist –expertise and the internal hospital infrastructure lay the groundwork for the creation of a center that should target a high number of cases. For stroke patients with rtPA treatment, an inverse relationship between the number of cases and the mortality rate at the hospital was shown . Under the condition of proof of expertise within a certified stroke unit and in alliance with national centers, hospitals with a lower number of cases have the right to be part of a Germany-wide stroke treatment network. As stated in numerous papers of the professional societies, this combination of comprehensive training, structural clarity and quality assurance is unique in an international comparison. All professional societies working in the field of stroke medicine (DeGIR, DGN, DGNR, DGS, DRG) emphasize that thrombectomy should be performed exclusively by neuro-/radiology specialists . Neurologists and radiologists are the only ones with the expert knowledge of the morphological and functional imaging necessary for decisions regarding therapy and with the pathophysiological and technical knowledge needed for the successful use of this minimally invasive method in cerebral vessels (evidence level 2b ). Mechanical thrombectomy must be integrated in the comprehensive network of certified stroke units. These structures are essential for further lowering the mortality rate in the case of severe stroke and improving treatment outcome for patients. The requirements outlined here provide the basis for high-quality care of acute stroke in Germany.